Dr. Francisco José Vidal Iglesias and Dra. Nuria García-Aráez García del Valle, winners of the X CIDETEC awards, received their prizes and diplomas from Dra. Soledad Larrocha, personnel manager at CIDETEC. 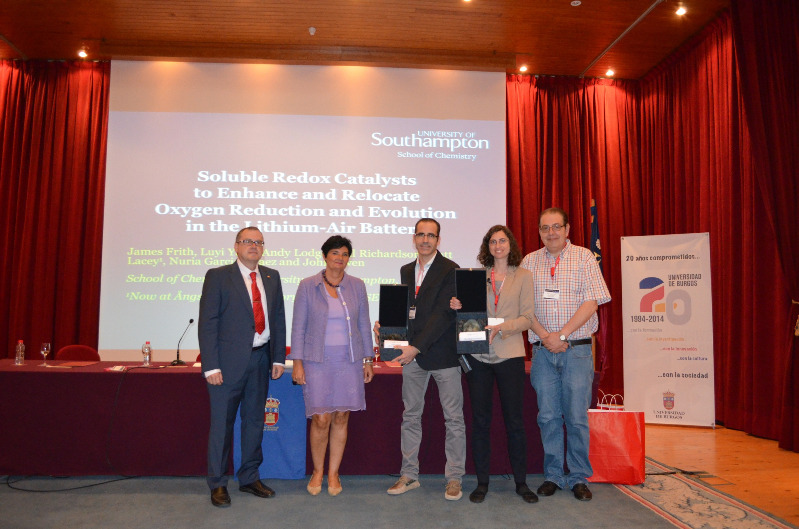 The ceremony took place within the framework of the "XXXV Meeting of the RSEQ Electrochemistry Group and I E3 Mediterranean Symposium: Electrochemistry for Energy and the Environment" held in Burgos between 14 and 16 of July 2014. Dr. FRANCISCO JOSE VIDAL IGLESIAS, a member of the Institute of Electrochemistry of the University of Alicante, was awarded $ 3,000, a trophy and the CIDETEC 2013 diploma for the Scientific Research in Electrochemistry granted to the article "Towards More Active and Stable Electrocatalysts for Formic Acid Electrooxidation: Antimony-Decorated Octahedral Platinum Nanoparticles" published in Angewandte Chemistry International Edition 52 (2013) 964-967. Moreover, Dr. NURIA GARCIA-GARCIA DEL VALLE ARAEZ, currently at the University of Southampton (UK), received the 2013 CIDETEC Award to Young Researchers in Electrochemistry worth 1500 euros, a trophy and a certificate for the quality and excellence of her curriculum. At the end of the event, Dr.. García-Aráez delivered a lecture. The CIDETEC awards have become a benchmark for excellence in Spanish electrochemistry and a hallmark of the activities for the specialized group of Electrochemistry in the RSEQ. In this regard, it should be noted that the XI edition of the CIDETEC Awards for best Scientific Research in Electrochemistry carried out over the last four years and that of best Scientific Career of Researchers in Electrochemistry, has already been opened.